Elisabeth Andel was introduced to the art of Aikido by Michael Williams Sensei​ and was immediately impressed by the way the principles of Ai (Harmony) Ki (Energy) Do (Life path) blended seamlessly into daily life and then and there became a dedicated student of the art (Ki no Kenkyukai). In 2000 she was appointed Assistant Lecturer by Master Koichi Tohei and became a senior instructor at the Byron Bay Aikido Club (Goshinkan Dojo). In 2002, following Williams Sensei’s change of direction, she joined Master Koretoshi Maruyama into his newly founded Aikido Yuishinkai organisation. Between 2004 and 2012 Elisabeth Andel accompanied Maruyama Sensei on his yearly international tours, producing seminar videos and gaining invaluable experience and insights into the art along the way. In 2012 she was awarded 7th Dan by Master Koretoshi Maruyama, as well as in 2014 by Michael Williams Sensei, who upon his return to Australia had founded Aikido Goshinkai. 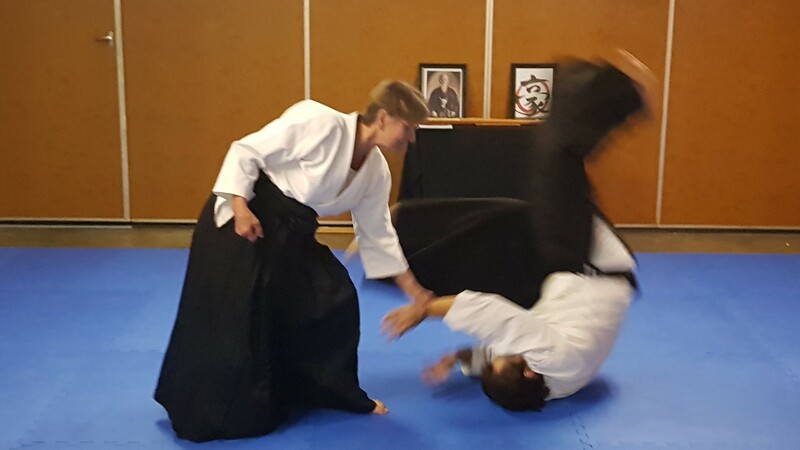 Elisabeth Andel is regular guest instructor at the Aikido Community, South Tweed Heads Dojo, and has also, in 2016, ​opened a training space in her home in Ewingsdale​, which was named ‘Setsudo’​​ by Master Michael Williams. 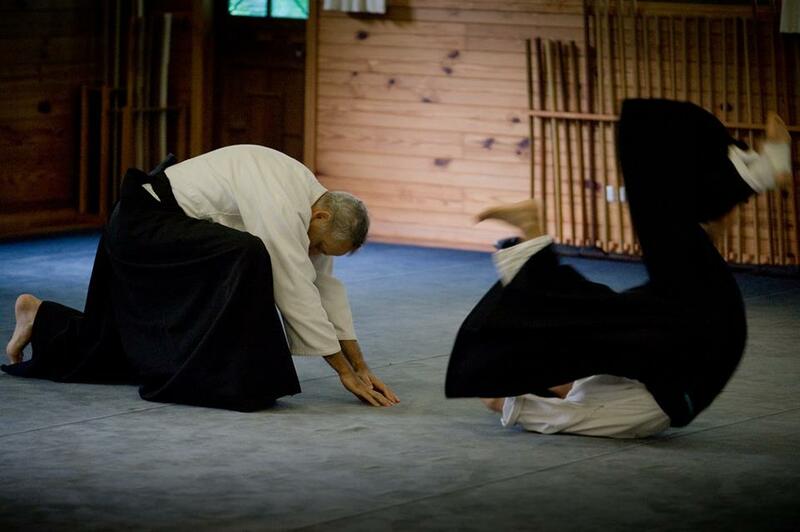 In Aikido we train to win against our own weaknesses, not to defeat a training partner. Only this kind of victory is true victory. Masakatsu agatsu. 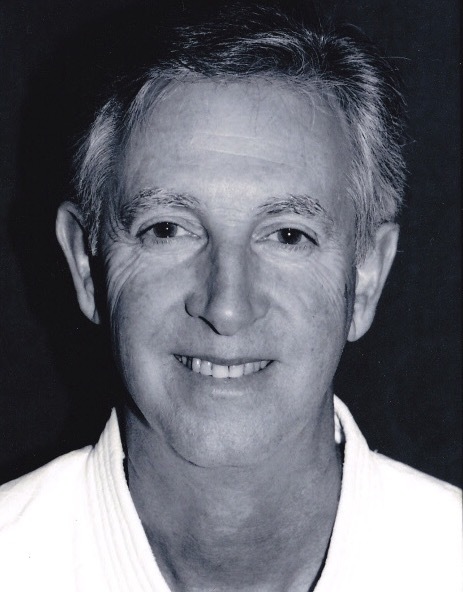 Michael K. started training with Michael Williams Sensei at the Griffith Uni dojo in Brisbane in 1985 and moved to Byron Bay with Michael Williams to help set up the Aikido school in 1989. He moved to Adelaide in 2005 where he joined John Ward Sensei’s dojo, which he took over in 2007. He moved back to Brisbane in 2009, where he trained and taught Aikido at the Griffith Uni dojo and at Redland Bay, as well as being a guest instructor at Everton Hills. Subsequently, in 2013, he returned to Byron Bay and the Byron Bay Aikido Club. He was awarded 6th Dan by Michael Williams Sensei in 2015. Mark Evans has been studying Aikido since the early 90’s and has trained extensively in Aikido dojos throughout the UK, Australia, and Japan. He is a senior instructor at the Aikido Goshinkai headquarters in Byron Bay, and is a direct student of the founder Michael Williams Sensei. In 2010 he spent 12 months living in Japan as a soto-deshi with Taiki Okajima Sensei (10th Dan, Aikido Yuishinkai). 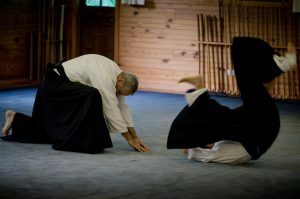 His main emphasis in training is the understanding, and application, of the basic Aikido principles, which lead to ‘easy Aikido’ through relaxed strength. Although self defence is a key aspect in any martial art training Mark also teaches the practical application of Aikido principles in daily life. In 2014 he started the Shako Dojo in Mullumbimby where Michael Williams Sensei performed the opening ceremony. In 2015 he was awarded 5th Dan by Michael Williams Sensei, Founder Aikido Goshinkai. 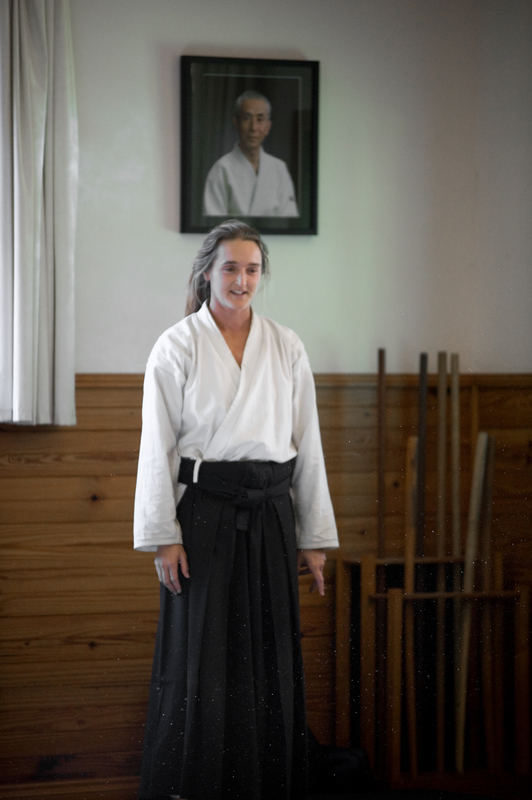 Joanne started studying the art of aikido in nineteen ninety eight and has trained under Michael Williams Sensei, the founder, for the majority of that time as well as attending yearly seminars from the Japanese instructors such as Kataoka Sensei, Maruyama Sensei and Will Reed Sensei. Of particular interest have been the ki healing arts and she continues to use these principles in her massage and body work practice. She started teaching kids class assisting Williams Sensei then took over the primary role teaching kids classes when he left for Fiji in 2006. She is a senior instructor in Byron and her love is teaching kids, sharing the magic of aikido, watching them grow, evolve and become more confident and grounded in any of their pursuits. In 2015 she was presented with a 5th Dan from Michael Williams Sensei, Founder Aikido Goshinkai and continues along the path of aikido, a path of peace. 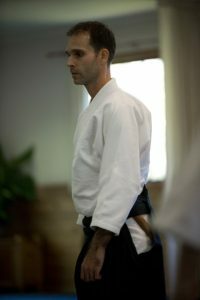 Peter Costin-Neilsen was introduced to the study of Aikido, after studying Karate for many years, when in 2004, he attended the Byron Bay Goshinkan Dojo, established by Michael Williams. Such an impression was made of this new art, that Peter could be found practising at the dojo on every opportunity developing new skills and long-lasting friendships within the Aikido community. It was such a revelation for Peter to discover a martial art that taught calmness and harmony, instead of creating tension and using sheer brute force to achieve a desired outcome. This was found to be true for both training at the dojo and in life generally. 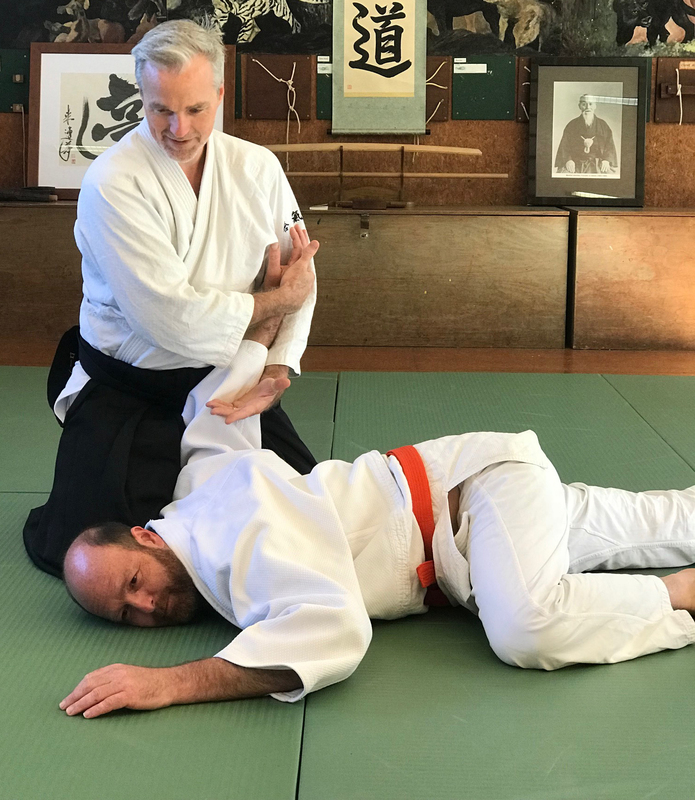 Peter was awarded the level of 4th Dan by Michael Williams Sensei in 2016, and now enjoys the role of instructor at the Byron Bay Aikido Club. “The power we ordinarily use is like the small, visible segment of an iceberg. When we unify our mind and body and become one with the universe, we can use the great power that is naturally ours” Master Koichi Tohei. Lawrence started his Aikido training in 1994 with Aiki Kai Australia. In 2009 he moved to Byron Bay and undertook training with Michael Williams Sensei and has continued to train to the present day. In 2015 he was awarded 3rd Dan by Michael Williams Sensei, Founder of Aikido Goshinkai. Lawrence has studied Aikido in Japan at Hombu dojo and was a live in student ‘Uchi-deshi’ at New York Aiki Kai, training under Yoshimitsu Yamada Sensei. 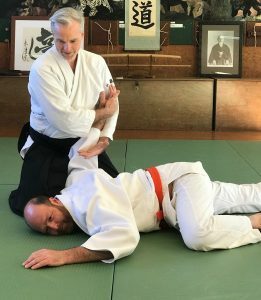 Lawrence has a deep interest in exploring the commonalities in a variety of Aikido styles and currently trains in Byron Bay, teaching weekly Aiki Kids classes at Byron Goshinkai Dojo, and is the Instructor at Bangalow Dojo.